Since different schools around the world offer the CELTA costs vary. Typically schools charge around £1000 ($1572 USD, €1243); accommodation (if required) and incidentals will be added on top of this. The CELTA is not an introductory course and students who have taken the CELTA course almost all say it is the hardest 4 weeks training they have ever undertaken (including their university education). If you are planning a CELTA course then it is recommended that you read extensively beforehand on all aspects of teaching English‏‎, are conversant with English grammar‏‎ and have several years experience under your belt. A CELTA or equivalent is usually required for higher jobs (e.g. with the British Council‏‎ or working as a Director of Studies; it is not normally a requisite for an entry-level job). 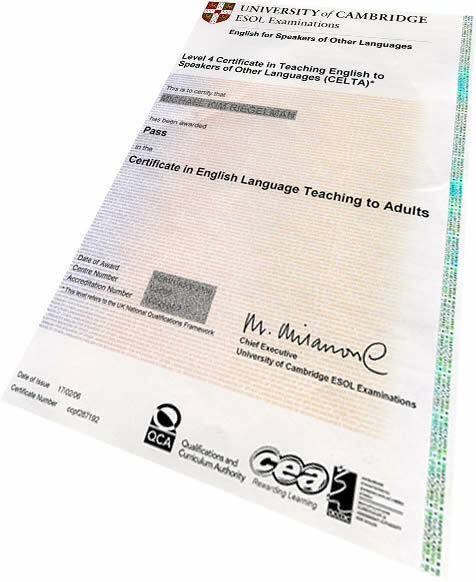 The course and exam are run as a franchise from Cambridge. In other words, any school can apply to run the CELTA course; Cambridge will come and make sure the school facilities are up to scratch, that the teacher trainers are of high enough standard and so on. They then charge the school for running the course. The course is not offered online yet although there are plans afoot to offer elements of the course online. How to Choose a Good TEFL/TESOL Course – which course is right for you?